Which brings me to Spenser. As a 2 year old, he cannot be expected to answer questions accurately. I ask these questions for fun. For practice, even though I know he is not a reliable source. I don’t count on the accuracy of his answers. 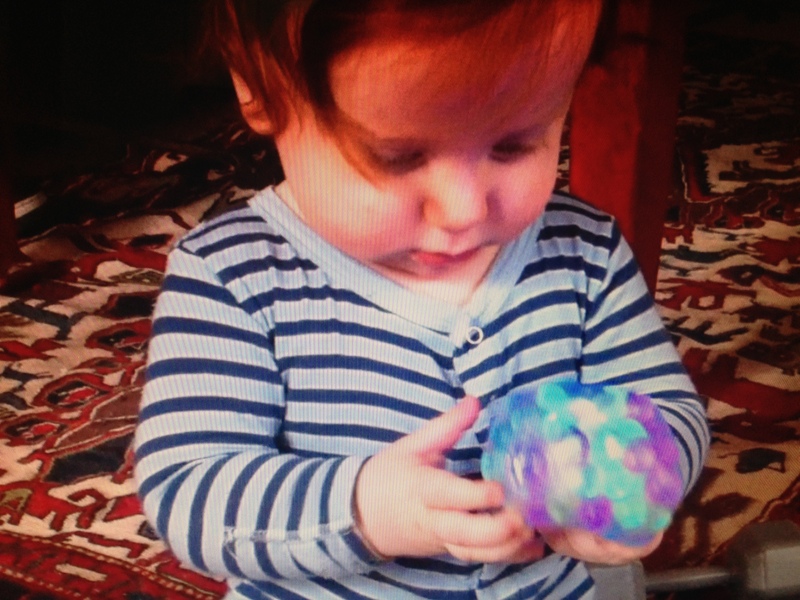 While I was putting on make up about 3 feet away, he was playing with his light up DNA ball – it’s a ball filled with balls. He’d gotten it as a gift when he was a baby. Suddenly he said, “Uh oh,” and I saw the ball had broken and two tiny balls rolled on the floor and two were in his hand. Immediately I went for his mouth. He pulled away. “Are there any in your mouth?” I asked. He kept his mouth closed. “Open your mouth,” I said and I tried to open it. A few seconds later he opened his mouth. His mouth was empty. But in those seconds, did he swallow? I couldn’t tell. “Did you swallow any balls?” I asked. He stared at me. His nodded -his nodding is the most adorable thing in the world – but it was not what I wanted to see at this point. He’s not a reliable source, I told myself over and over as I googled the product to make sure it said non toxic. It had to be, right? The fear would be in choking on the balls, not being poisoned, right? I called the company and left a (frantic) message. Stop asking him, I told myself… he’s not a reliable source!! I kept trying to replay those seconds in my head… where he did or didn’t swallow. I don’t think he swallowed, I concluded. “Swallow ball!” S said with delight. I fed him lots of food, hoping he’d either throw up or poop out the ball he probably didn’t eat. I decided to ask him more questions to check his reliability today. “Do you like pasta?” I asked. “No.” he said. That was true. He’s going through a not liking pasta phase. We hadn’t. What was going on? Why was he being reliable?! “Is your shirt orange?’ I asked. It was. But maybe that was an easy question. “Did we go swimming this morning?” I asked. “Yeah,” he said, pushing buttons on a computer toy. OK. That wasn’t true. Maybe he’s just answering what he wants to do like he doesn’t want any pasta and he does want to go swimming… and he does want to swallow those little balls. AH! I was driving myself crazy. They wouldn’t put poison in a children’s toy, would they? And just then… a woman called back from the company saying the product was safe if swallowed and non toxic. I was relieved, though pretty sure he didn’t swallow it anyway. This is one way motherhood is hard. I watch S as much as I can and I’m also babyproofed so I can feel safe letting him play in his room while I put on make up or cook or whatever…. – but little things slip by, like this ball. I feel angry at myself. I didn’t remember it was in his toy bin and wouldn’t have thought it would break… I just want to keep him safe. Luckily, he is OK.
You hear parents of all ages saying when your a parent you never stop worrying… I get it now, and it’s only just starting. I love my little unreliable source. His character development is most definitely mysterious and exciting. I’ve been checking his poop and so far, nothing. This entry was posted in MOM STUFF and tagged dna ball, mom solo, single mom by choice. Bookmark the permalink.